A year and a half in Tokyo, the most fun city in the world. Ben Kemp looks like a rugby player, but he has the most delicate falsetto voice and a rather poetic songwriting touch. His band, Uminari, are tight and very cool in a quirky Japanese way, especially the drummer who is so cool he doesn’t need drumsticks. We saw these guys at the Classic Comedy Bar and they put on a great show. But they were supported by local singer-songwriter Anna Coddington, and I liked her set even more. 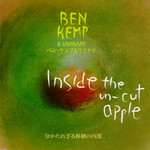 Ben Kemp is a very nice Kiwi musician who has lived in Japan for some time now. He has gotten together with a group of Japanese musicians to form his band. The music works really well live — they go for extended soundscapes built around each song, with Kemp’s voice sometimes acting as another instrument. The mood ranges from gentle and contemplative to a bit more noisy and experimental on some tracks, where they might try to evoke the sound of the sea or a storm. It’s hypnotic stuff. Politics, cyberpunk (pseudo)science, philosophy, big explosions and scantily-clad nubile young women. Sure it’s only a comic, but it still left me as breathless as a frenetic action film. This chunky book looks to be a compilation of several episodes of a series. The great thing is that they have translated only what they had to — the comic still reads right-to-left, and a lot of the Japanese writing (especially the onomatopoeia) is still there. They’ve done a good job of preserving the feel of the original manga while making it readable in English. “The Matsugane Potshot Affair” is your classic Festival film: amusing, but also with many uneasy moments. Weird. A bit pervy. Very non-mainstream; even more so than its very different predecessor “Linda Linda Linda” (directed by the same gentleman). When I lived in Japan (and even before then) I discovered lots of great Japanese music. (And also lots of bad music, but never mind about that.) Here are five of my favourite pop bands. None are particularly new, but maybe I’m just a “classic J-pop” kind of guy. I don’t know if all of these these could even be considered J-Pop — I don’t think all Japanese pop bands are necessarily J-Pop — but maybe J-Pop is more a state of mind than a sound anyway. Linda Linda Linda is a great movie about the Redemptive Power of Rock ‘n’ Roll. This may sound like a contradiction — surely most films about RPRR are pap. But Linda Linda Linda is a wonderful combination of arthouse weirdness, raw energy, social commentary and Japanese schoolgirls. With ingredients like that, it’s no wonder the result is so much fun. The story of Zatoichi has been around in Japanese movies and TV for a while. I saw this latest remake recently — it is a lot of fun, especially if you consider artistic, cinematic dismemberment to be fun. The director Takeshi Kitano said he wanted the blood in this film to “look like flowers blossoming across the screen”. It does have a certain unearthly quality that makes it quite mesmerising. And a good thing too, because there is a lot of blood in this film. I really liked this film. Affecting performances, likeable (but not too likeable) characters, and lots of funny, strange moments. A pretty accurate evocation of how Tokyo can appear to the newcomer. Ah, those were the days. Cow parades have been going on for a few years, in various parts of the world. I was excited to discover decorated cows in Marunouchi, downtown Tokyo, where I worked. So excited that I decided I would try to shoot all 60-odd of them (with my camera). This was the first cow parade in the Far East, featuring lots of Japan-themed cows, and one or two impressive technology-enabled cows. It was fun hunting them all down – I even found some interesting parts of town that I had never been to before. In the end, I ran out of time – I only managed to find 61 of the 64 cows. Some of them were sneakily positioned inside buildings, and one was way over on the other side of Tokyo station. Some of the cows also moved around over the course of the parade… Anyway, I had to steal other people’s photos to complete the three missing spots in my photo album. Sunday was a beautiful day. Blue skies made it a bit easier to get up this morning, As usual, difficult to get out of bed in time for breakfast, but again it was well worth it, even if the omelette wasn’t as good as yesterday’s spring rolls. Dragged ourselves out of bed unenthusiastically for what we expected to be an unappetizing breakfast – it was included in the price of our room. Turned out to be delicious! Fried spring rolls, salad, grilled fish, pickles, and of course the breakfast staples of miso soup, rice and dried seaweed. We returned to our room feeling satisfied and then just lounged around for an hour or so. We decided to take it easy – the first band we wanted to see, Goldfrapp, weren’t on till 1 o’clock. It was still raining a bit, so we thought we’d go to an onsen (hot spring bathhouse). There were a couple nearby (no doubt very popular during the ski season). One had outdoor baths, and we’d gotten discount tickets for it at last night’s restaurant, so in we went. Like most such places, the baths were segregated, so Jo and Lora went to the ladies’ bath and I to the gentlemen’s. It was crowded – I had to wait about 5 minutes for my pre-bath shower. Waiting in line is never fun, but even less so when you’re naked. Anyway, the bath was lovely, half-enclosed by a wooden roof and with nice trees to look at.